Even if you don’t realize it, you’re probably employing some kind of risk management in your organization. Over time, you develop procedures to make sure things don’t go wrong and put plans in place to reduce organizational impact if they do. Creating a risk management plan is simply about formalizing that process and being able to devote your resources more effectively. The first step in this process, and one of the most important, is identifying your risks. A risk map is built by plotting the frequency of a risk on the y-axis of the chart and the severity on the x-axis. Frequency is how likely the risk is or how often you think it will occur; severity is how much of an impact it would have if it did happen. The higher a risk ranks for these qualities, the more threatening it is to your organization. Last week we discussed the importance of risk maps and why every risk-conscious organization should begin using them (check out our post on how risk mapping allows you to gain insight, use valuable resources efficiently, and improve mitigation). Now, we’re giving you four tips on how to build the map itself. 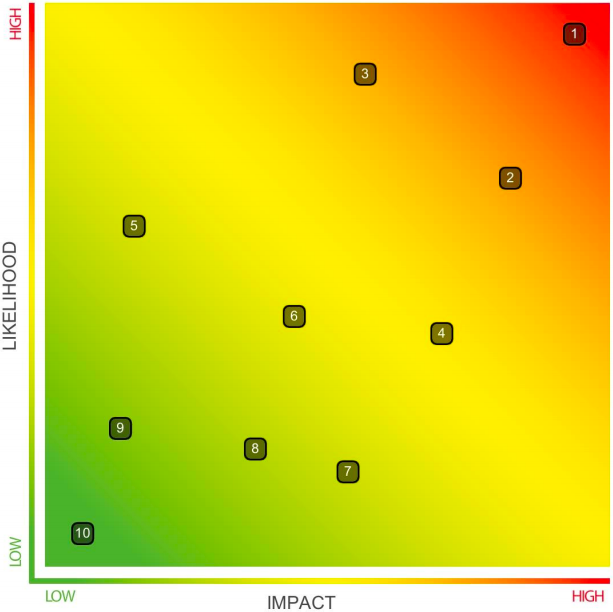 Why should your organization be using risk maps? Building a risk map brings valuable benefits. You will have a thorough understanding of your risk environment and how individual risks compare to one another. You can use this to strategically prioritize your risks and determine where to use your limited resources. A risk map is built by plotting the frequency of a risk on the y-axis of the chart and the severity on the x-axis. Frequency is how likely the risk is or how often you think it will occur; severity is how much of an impact it would have if it did occur. You’ve successfully identified the risks that are facing your organization. (If you’re just joining us, check out our blog post from last week!) But now what? Risk management isn’t just about figuring out what risks there are: you have to know what to do about them and create a thorough plan for staying on top.